Oil on panel, 65,5 x 91 cm. A hunting party travels down a winding road in a peaceful landscape. Salomon van Ruysdael has given the striking cloud formations a prominent position in this scene, showing how he was not only interested in depicting a scene, but also in capturing a certain mood. The subdued shades of grey, green and yellow combined with the cloudy sky bears witness to Ruysdael’s fascination of how the aftermath of a downpour influences the atmospheric character of a landscape. Ruysdael was a Dutch Baroque landscape painter. He painted landscapes, both bare and with staffage, as well as seascapes. As a young artist, he worked with tonal painting, where the characteristic, fine transitions between green, yellow and grey tones shroud the subjects in a uniform fog. Later in his career, his colours became stronger and the contrasts between light and dark more clear. 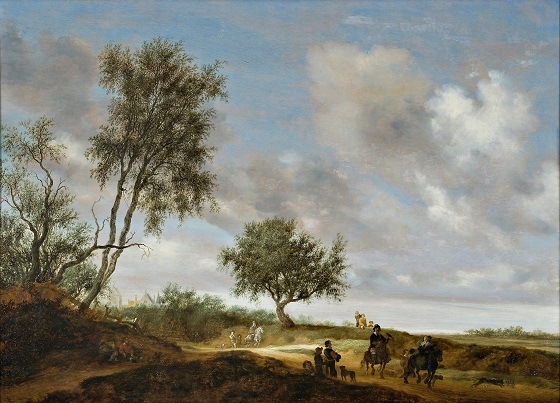 Ruysdael’s landscapes are sensitive depictions characterised by a great silence and are often executed with an almost impressionistic approach to the subject.